This 47ft Riviera Yacht powered by twin C12 765HP Caterpillars fishes out of Papagayo Marina, with Captain Rafael Ortega at the helm. 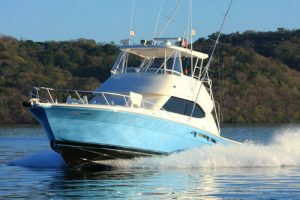 Cruising at 25 knots, a four-time top finisher in World Billfish Series tournaments, boasting a crew with experience in the United States, Bahamas, St. Thomas and Panama, she comes with an air conditioned salon; three staterooms and two full bathrooms. She has a full electronics package (sonar, radar, GPS); tournament-grade two-speed Shimano Tiagra tackle ranging from 20 to 80lbs; spinning tackle, and is fly fishing capable.